« PASS Business Analytics VC August Meeting–Power BI, Mission Possible! 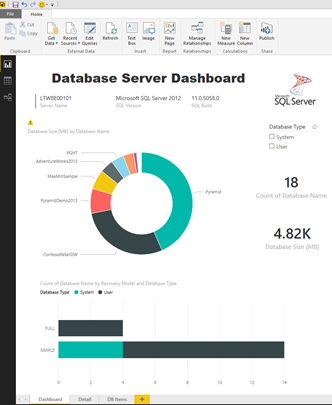 Here we can see that I included the SQL Server logo, the name of my machine, the version and build number of SQL Server I am running, and then some information about the databases – the count, sizes, types, last backup, recovery model, and file information. Now let’s take a quick look at how this was built. First thing you will need to download and install the Power BI Desktop application. It appears that since the initial release the application has already been updated a few times, latest build version is 2.26.4128.403 and it was released on August 20, 2015. The application is available in both 32 and 64-bit versions. Once you have the application downloaded, installed, and started up, the first thing we will want to do is get some data. You can either click on the Get Data on the Getting Started screen when you open the application or in the Ribbon you can click on Get Data and then SQL Server. 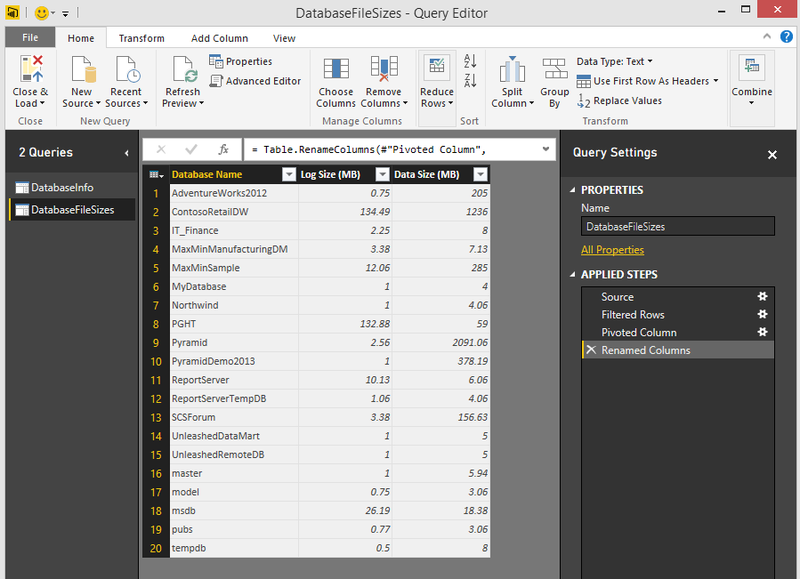 Once the query has been populated to create the data we clean it up a little bit by splitting some columns, changing data types, renaming the columns to be more user friendly, and provide a name for the data query. Once this data set is added we apply a filter, pivot the data, rename the columns, and then provide a name for the query and close and load the data. Now that we have the two data queries, we can establish a relationship between the two (you could also merge them together if you would prefer). And then you can create reports and add text boxes, images, slicers, and visualizations. Now we could stop here at this point, but what fun would that be. What if I wanted to be able to monitor and report on my databases while I am out on the road or having a conversation with a colleague? Hmmm, there must be a solution for that…and ‘Yes’ there is! 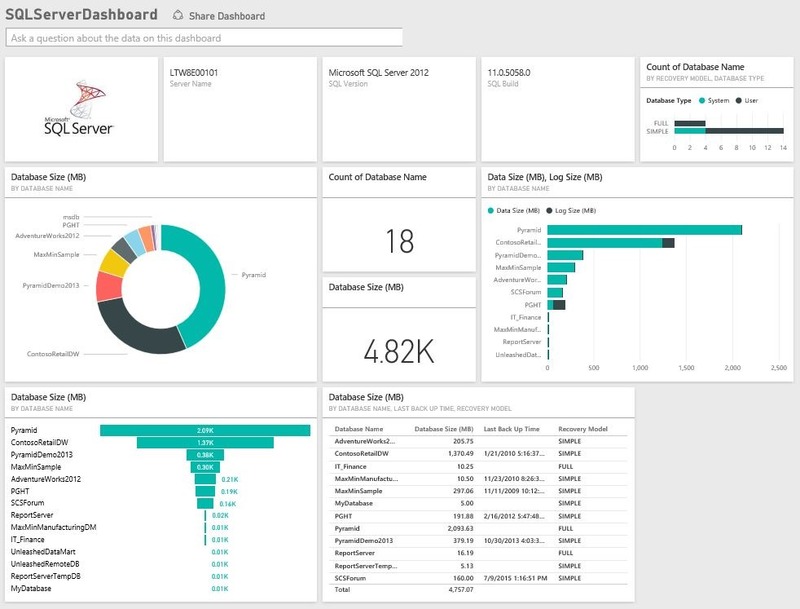 Microsoft provides the online PowerBI.com service that allows you to upload (or Publish) your Power BI Desktop creations. I already have an account, so I can click on the Publish button in the Ribbon and then I will be prompted to save the file and if I have already published this before an option to Replace the existing dataset (or Cancel). The solution will then be published and you will be provided a link to access the item directly. Once published I can create a dashboard in the online service and pin the items I want to my dashboard from the reports I included (see the initial image in the blog post for the final result). You can also enhance the reports and edit them if needed, just be careful though, if you publish from the desktop you could override changes in the online version of the reports. Now, are we done yet? No way, what about refreshing the data? But how can I do that, the data is running on my laptop… No worries, download and install the Power BI Personal Gateway. 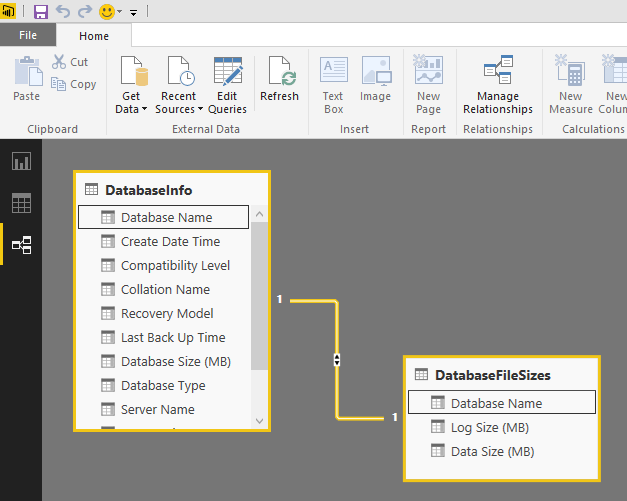 Once this is downloaded, installed, and configured (Power BI Personal Gateway online knowledge base article) you will have the ability to refresh the dataset that is loaded in the online PowerBI.com service. How cool is that! 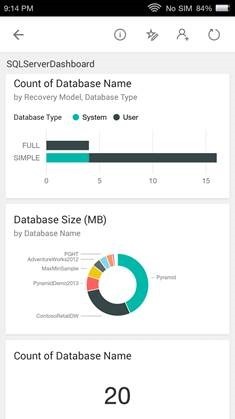 And you can see in the below screenshot that is exactly what I did, if you compare this to the initial dashboard at the top of the post you will see that there are two additional databases (flashback goodies – Northwind and pubs return!). There are lots of possibilities for expanding on this set of reports – analyzing database and table statistics, usage, queries, and more. I would really love to hear what you think of the “new” Power BI and the ideas and creations you are building, leave a comment and let me know, thanks! 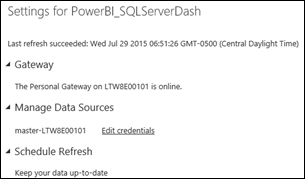 This entry was posted on August 25, 2015 at 6:56 am	and is filed under Power BI. Tagged: powerbi. You can follow any responses to this entry through the RSS 2.0 feed. You can leave a response, or trackback from your own site. 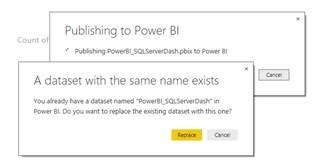 Great article, can you post the code for PowerBI as a download? Details: “Microsoft SQL: Incorrect syntax near ‘‘’. This is most likely because of the font and the single quotes. You will just need to change those once you copy the statement into the editor.